Footage of what would have been the staged death of Jay-Z at Hot 97′s Summer Jam 2002 has now surfaced online, showing just how intense Nas’ now-defunct beef with the rapper was ten years ago. 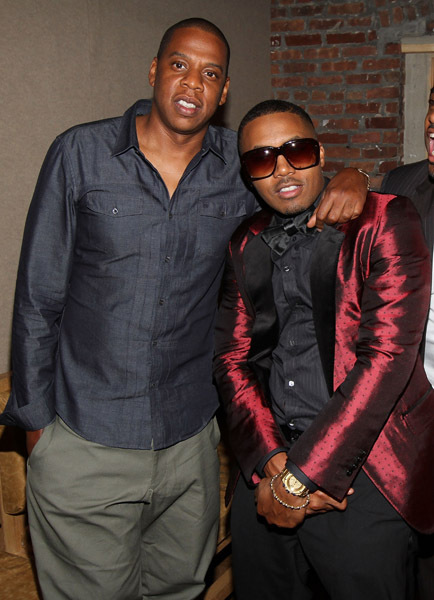 In the now-released footage, fans get an up-close look at the demise Nasty Nas envisioned for Jay at the height of their rap feud. Unreleased footage of what was going to be the lynching of a Jay-Z effigy by Nas has released. The fake “Jay-Z” was supposed to be complete with mechanical movements that was intended to be hanged in front of thousands on the Summer Jam stage. Hot 97 of course didn’t let him do that which explains why Nas didn’t perform that year. After Hot 97 denied Nas’ request to stage the hanging during his set, he appeared on rival station Power 105.1 to lash out. Hot 97′s Angie Martinez later denied claims suggesting they pulled the plug on Nas to protect their relationship with Jay-Z. Let’s hope that this beef never happens again! Pop the hood on what almost was Jay-Z’s lynching. This entry was posted in Gossip and tagged Angie Martinez, hot 97, Jay-Z, Nas. Bookmark the permalink.